Home Headlines 60 Slices of Post-apocalyptic Weirdness in the Legacy: Wasteland Almanac! 60 Slices of Post-apocalyptic Weirdness in the Legacy: Wasteland Almanac! Today we’re really pleased to bring you the release of the Wasteland Almanac, a brand new PDF in the acclaimed Legacy 2e Life Among the Ruins. 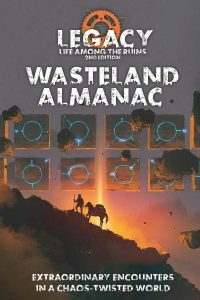 Legacy: Wasteland Almanac is available in PDF from Modiphius.net and DriveThruRPG.com as part of our Legacy 2E Collection. 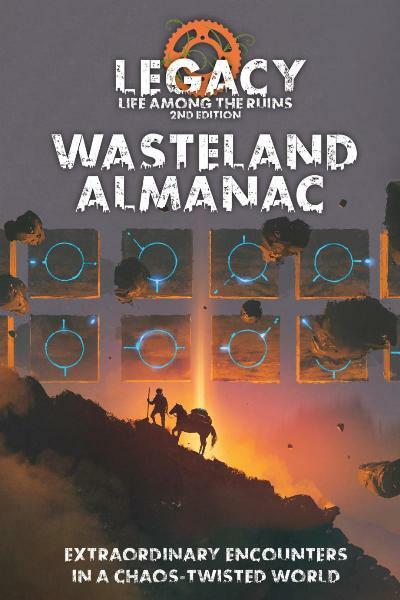 The Wasteland Almanac for Legacy: Life Among the Ruins Second Edition gives you 60 gobbets of post-apocalyptic weirdness to put in your wasteland, divided up into strange settlements, reality-warping devices and monstrous threats. Each entry offers suggestions of how to use it in your game – and how to mutate it as time passes. If you’re looking for inspiration for your Wasteland, in Legacy or any other post-apocalyptic RPG, look no further! “Legacy is a game about rebuilding your world after a reality-twisting apocalypse. Your families and characters have emerged from their shelters and bunkers, ready to explore and understand and restore the ruins that surrounded them. But what sort of things will they encounter outside the safe fringes of their Homeland? “This book is here to help. Within its pages you’ll find dozens of settlements, dangers and strange devices to find. In writing these entries we’ve tried to leave room for your group to put your own stamp on the things described, and each entry has questions and prompts that will guide your player’s interaction with it – and help you extrapolate how the settlement, threat or device may change as the ages turn. After all, one of the best things about Legacy is that you build your world together as a play group: defining what the world looks like, what caused the Fall, and where you now make your homes. We hope you enjoy this latest Legacy release and if you want more be sure to check out our Legacy 2E Life Among the Ruins Collection. Look out for more great titles, coming soon!